The first phase of the most important Star Wars story of 2008 ends with devastation on an awe-inspiring scale in part four of “Vector”! Nearly overwhelmed by an ancient evil run rampant, fugitive Padawan Zayne Carrick, the con-artist Gryph, and the Jedi Celeste Morne have made a choice of cosmic significance, its consequences reshaping not only the course of their lives, but the fate of the entire galaxy! Surrounded by Mandalorians, they face a crossroads where every path demands sacrifice, and no matter what is saved, something else will be lost! 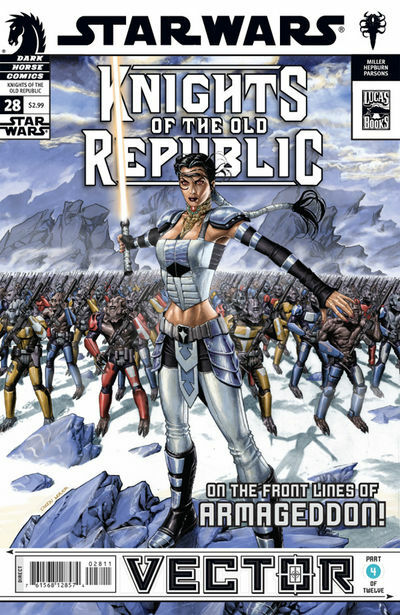 KOTOR is still rockin’ the cartoony art of Scott Hepburn, which just doesn’t seem to fit the seriousness of this story arc. If he was doing the issues with the Moogo Brothers, then it would make sense. But I just don’t feel the terror of being faced with hordes of thousands of dark side beastly killing machines. Considering that the artist on these books have been a revolving door, I’m guessing that a change will be coming soon.